One of the premier plastic surgery events will take place in Miami from February 10-12, 2011. As a board-certified plastic surgeon in Chicago, Dr. Brian Braithwaite says the Annual Baker Gordon Educational Symposium is extremely important to him because he believes tradition and innovation are essential to a successful plastic surgery practice, regardless of whether he is performing breast augmentation or BOTOX ® injections. The 45th Annual Baker Gordon Educational Symposium will take place this February 10-12 in Miami, jointly sponsored by the American Society for Aesthetic Plastic Surgery (ASAPS) and the American Society of Plastic Surgeons (ASPS). As the premier event in the aesthetic enhancement industry, Dr. Brian Braithwaite says embodying the innovative spirit and extensive expertise present at the Baker Gordon Symposium is an integral part of the success he has experienced at his Chicago plastic surgery practice. Dr. Braithwaite says he is looking forward to this year’s symposium because it affords him the chance to discuss the latest shift in cosmetic surgery with the most talented pool of plastic surgeons from around the globe. As the industry continues to recognize the benefits of effectively combining surgical contouring and volume addition, Dr. Braithwaite says he firmly believes this is the wave of the future for cosmetic procedures ranging from breast augmentation to tummy tuck surgery. At the Aesthetic Institute of Chicago, Dr. Braithwaite says he is passionate about pushing the level of innovation in the field of plastic surgery, whether he is performing a subtle enhancement with dermal fillers, a more dramatic transformation with liposuction or a tummy tuck, or the combination of a number of procedures such as the mommy makeover. He adds that attending events such as the Baker Gordon Symposium provides him and his colleagues with the chance to interact and creates a communal hotspot for further improving patient safety and satisfaction. Brian M. Braithwaite, MD earned his medical degree from the University of Illinois College of Medicine in Chicago. After a surgical internship, he joined the United States Navy to become a flight surgeon. Following a tour with the Marines, Dr. Braithwaite became a resident in general surgery at Keesler Medical Center, and then went on to the University of Louisville where he completed his plastic surgery residency. Once his training was complete, he became a staff plastic surgeon at Bethesda Naval Medical Center, where he treated a number of troops from overseas, as well as breast reconstruction patients from the Breast Care Center. Dr. Braithwaite is a fellow of the American College of Surgeons, and is certified by the American Board of Plastic Surgery. 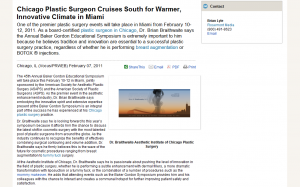 The Aesthetic Institute of Chicago is located at 601 West Randolph St. in Chicago, IL 60661 and can be reached at (312) 361-8108, or found online at www.drbraithwaite.com/ or facebook.com/plasticsurgeonschicago page.